The Organic Trade Association, via a diverse Steering Committee, is coordinating the effort to advance a voluntary industry-invested organic research, promotion and education check-off-like program, referred to as “GRO Organic” (shorthand for Generate Results and Opportunity for Organic). This is a private-sector initiative that will be collaboratively designed and implemented by organic stakeholders. We want to stand up GRO Organic as an opt-in program that pools resources from everyone who can contribute so that we can collectively address critical needs across the organic sector. In order to be effective we need to determine the best way to encourage broad participation and set up a fair governance structure, so that we can research where we need to, promote where we need to, and educate where we need to, based on the best potential ROI for organic. This is no small task, but if you’re interested in being part of the solution, please read on. To gain the best thinking from stakeholders on how to set up this industry-wide voluntary program, we are taking six months to gather input from anyone interested in providing detailed thoughts in writing on a series of key questions. 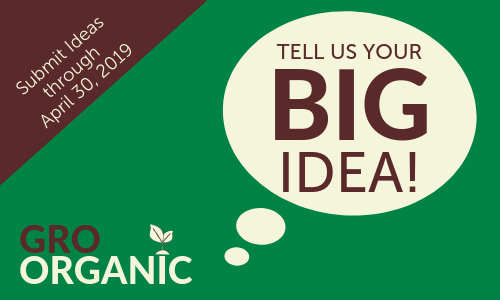 We’re also asking you to share your big idea to positively impact organic. This is an important opportunity to weigh-in and help us shape this voluntary program at the start of the process. The Organic Trade Association submitted an application to the U.S. Department of Agriculture (USDA) in May 2015 to consider implementing a federally mandated organic check-off program. USDA in January 2017 officially proposed a nationwide organic check-off program, opening the process for public comments. In May 2018, over one year after the comment period closed, USDA terminated the rulemaking process without bringing the check-off vote to an industry referendum. Over the summer of 2018, the organic industry pivoted quickly to set up GRO Organic as a voluntary program to do the work that the federal program might have done. There are now four prototype programs currently underway while the work to establish a voluntary program begins. While a voluntary program does not have to be bound by the same constructs and prohibitions of the original USDA proposal, you can refer back to the details of the federal proposal in the posted resources if it useful to you. The private-sector PROGRAMMING CURRENTLY UNDERWAY for coordinated organic research, promotion, and education. The USDA ORGANIC RESEARCH AND PROMOTION ORDER proposal summary from 2017. Ideas are being requested from November 5, 2018 – April 30, 2019. We want you to take the time you need to share your ideas and respond to our questions in a thoughtful way. If your organization has a Board of Directors, policy committee, or membership base, please engage them in this opportunity. You have up to six months to provide input—we look forward to hearing your ideas when you’re ready! Electronic submission is required. E-mail GROideas@ota.com and embed or attach your input. Anonymous responses will not be accepted. This allows us to get in touch with you if we have questions about your ideas or need clarification on your input. Please share your name, location, and business affiliation as part of your submission. The vision that propels the GRO Organic voluntary research, promotion, and education program forward is a future where we have innovative solutions and meaningful funding to address the organic sector’s most pressing needs: bringing new farmers into organic production and making sure existing farmers can stay in organic, increasing organic research, and educating the public about the benefits of organic. The goal of this program is to stand up a collaborative framework that engages the full organic supply chain in promoting the organic brand and organic production practices and advances essential research to solve problems facing organic farmers, processors, handlers and businesses. The need is widely agreed upon—how we solve for it is what we must now work together to determine. Please respond to as many questions as possible and refer back to the specific question numbers in your response. 1. TELL US YOUR BIG IDEA! Do you have a good idea? Something that could have important and long-lasting benefits for organic farmers, companies or consumers? Maybe you already have a specific idea for how the organic industry could break through to consumers about the benefits of organic, or boost support systems to transition more U.S. organic farmers and acres? If you have a big idea, please tell us what it is. Then, challenge yourself to consider your big idea, or the general GRO concept for voluntary coordinated research, promotion, and education, against the following strategic questions. Put pen to paper and really walk us through how your ideas could work. a. Who are the stakeholders that could and/ or should opt-in to participate? b. How do we maximize participation? c. How do we make sure there is equitable participation? d. How do we encourage participation at both ends of the supply chain— farmers and retailers, of all types and sizes? e. Should there be recognition for those that participate? a. Should the cost to participate be based on organic sales? b. Should the cost to participate be standardized or discretionary? c. Who should be funding the program? d. Should there be a different model for points along the supply chain (e.g. producers, manufacturers, distributors, importers, retailers, etc.)? a. How should priorities get set? How should decisions be made? b. What should be the composition of decision-makers? c. Should participants have equal voice, or should influence be weighted based on contribution? d. Should we be building a framework that could be a USDA federal check-off program in the future? e. Should there be restrictions on how the dollars could be used? a. What macro priorities will benefit all organic businesses? b. How can priority areas be set and sustained over time? c. Should there be a set allocation of funds or discretion based on priorities? d. How can the priorities between each sectors needs and the biggest needs for organic overall be balanced? e. How should a communications strategy that has broad buy-in be developed? f. What are your thoughts on how to best approach promoting organic? g. Besides research, promotion and technical assistance are there other critical priorities to address? h. What are the top three research priorities GRO can address? a. Should we continue to call a voluntary program a “check-off”? What better describes the effort? b. Do you know of other industry-invested research or consumer education programs that you suggest we look at? c. What other questions need to be asked? After April 30, 2019, all responses shared with GROideas@ota.com will be organized and summarized for further conversation. Thank you for taking the time to help move organic forward with a voluntary research, promotion, and education program. We’re excited to work together to see what’s possible!